The Historic Town of Guanajuato and Adjacent Mines are an example of an influential Mining Town, with its technological innovations and Baroque architecture. It became the world's leading silver-extraction centre in the 18th century after the decline of Potosi. The wealth that resulted from this can be seen in monuments like the church La Valenciana (1765-1788). This church, built near the entrance of the eponymous mine, has a Churrigueresque portal, a number of gilded altarpieces and a pulpit that is incrusted with ivory and precious hardwoods. When Puebla is Mexico’s Arequipa, Guanajuato must be its Cuzco or Potosi. Cuzco because it’s all built up against a mountain wall, a warren of little steep streets and unexpected vistas. And Potosi because of its silver mining connection of course. I stayed for two nights in the Valenciana neighbourhood (a splurge at the Casa Estrella de la Valenciana), and had the best views from my room and even better ones from the bathroom. The city lies in a “bowl” (somewhere I read it’s a ravine) between mountain tops, just like a smallish La Paz. I am throwing in all kinds of Peruvian and Bolivian comparisons, as Guanajuato resembles those countries more than the rest of Central Mexico which is very Spanish-colonial/westernized. The prettiest building in town is the Teatro Juarez. 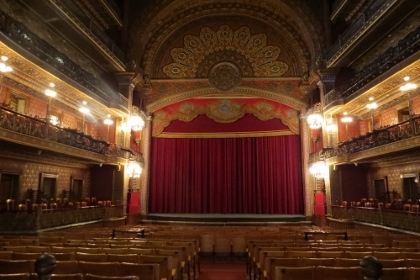 Sorry, another comparison comes to mind: the Teatro Tomas Terry in Cienfuegos (Cuba), another opulent turn-of-the-century theatre. Teatro Juarez is open to the general public, and for a fee of 35 pesos entrance + 30 pesos camere fee you can visit several of the rooms and of course the main stage hall. Its decoration is Moorish-influenced, very nice. I finished my visit at the obscure Mummy Museum. It lies in the outskirts of town, probably outside of the borders of the WHS. It's quite a tourist attraction with over 100 "mummified" (dried out) corpses on display taken from the general cemetery when their families could not pay the grave taxes anymore. It's a bit of a gimmick. I did feel bad about it, think of your dead grandparents being displayed like this in their nightgowns. 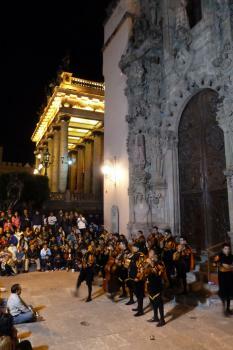 Guanajuato also is a university city, which results in a young crowd and many cheap eateries & cafés. I did see less of a Mexican middle class here, which were so prominent in Mexico City and Queretaro - occupying the terraces of restaurants or drinking expensive coffees. This is the reason I travel! The full day we spent here was one of the best days on the road we have had. To kick things off there was our journey into the centre, this normally rudimentary aspect of travel was unexpectedly elevated to a unique experience. Our taxi screamed through endless tunnels under the city centre, before depositing us, grinning like Cheshire cats, at a tree lined piazza. Whilst not quite as picturesque, this unique arrival drew to mind our first trip down Venice's Grand Canal and let us know we were in for something a bit special. A wonderful breakfast on the tree lined central square set us up for a day of sightseeing. The highlights were the theatre and the viewpoint from the Pipil, including a trip on a funicular railway, something that almost always brings a smile to my face. Just wandering through the mostly traffic free centre was thoroughly enjoyable. We decided to head up the road to see the church and mines at Valenciana, which really should not be missed. The mines were fairly interesting and give an idea of how the wealth of the city was accumulated, whilst the magnificent baroque church showed how that wealth was displayed. Left at this point Guanajuato would have been a very noteworthy city, however our return in the evening elevated it to something truly world class. On top of a centre thronging with bars, restaurants, students and families out enjoying the wonderful atmosphere - things that win me over in even the most banal place - were the Callejoneada. These are bands of locals dressed as medieval troubadours, who gather and lead guided tours as they sing dance and tell stories to their gathered crowd. It was an unforgettably joyous couple of hours spent following them around, struggling against our limited grip of Spanish to follow what was happening, but just rejoicing in being free from cynicism and enjoying the sheer fun of it all. 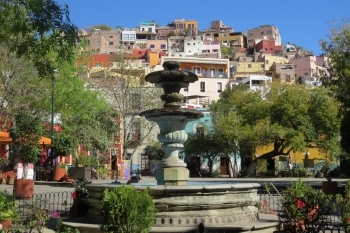 Guanajuato was the standout city on or trip around central Mexico. The impressive setting, industrial heritage and glorious buildings tell a wonderful story. However the sheer joyous atmosphere, especially with the callejoneada elevated it to one of the best days we have ever had on our travels. Stay for an evening and throw yourself into the atmosphere of this wonderful city. I've visited 5 WHS in Central Mexico in October 2014 and I've really liked Guanajuato. It is different from the nearby cities of San Miguel de Allende and Queretaro, it is much more colourful and its layout is so strange, set against the hills and with so many underground streets! Have a cappuccino on a balcony by El Callejon del Beso while the song birds are twittering. Guanajuato is a beautiful Mexican jewel that has always stuck with me after all these years. Most definately worth a visit. Go! If it is another day in Central Mexico it must be yet another run-of-the-mill UNESCO-inscribed colonial “Centro Historico” – Mexico really has gone overboard in inscribing its colonial towns! But no, this isn’t just any Centro Historico – this is Guanajuato; a town which stands head and shoulders above its fellow Mexican Colonial WHS for interest. 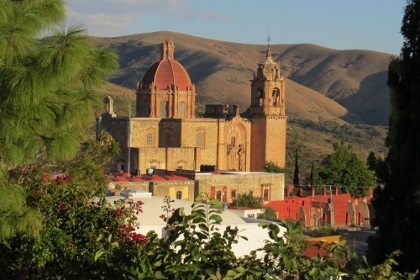 If you visit only one – then choose Guanajuato! Yes, it is rather touristy – though mainly with Mexicans themselves which, to an outsider, adds a degree of interest to the crowds. Indeed, thinking about it, we are probably attracted to the city over others just because it is SO Mexican! If you are travelling by self-drive car as we were, the arrival can be a bit of a surprise! Suddenly, as you reach the town centre, set deep in a ravine, there is nowhere for the road to go and it dives underground beneath the houses into a long one-way tunnel and, after various twists and turns, comes up a few minutes later God knows where! We consult our guidebooks and note that the map of one of them (obviously for walkers!) states “subterranean roads not shown”. The town is indeed 2 worlds “road-wise” – above, a colonial city of narrow winding streets, stairways and pleasant piazzas, deep-green manicured trees and tinkling fountains, whilst below, a labyrinth of narrow roadways – I have read that driving a car there is “an experience somewhat like zooming around in the Batcave” – not far wrong! Although some of them are relatively new, the original tunnels were created in the mining days to divert the river which often flooded city and mines. The, much later, building of a new dam freed them for use as ready made by-passes and enabled large parts of the otherwise impossibly crowded town to be made traffic free! This city, built on gold and silver, was for many years the wealthiest in Mexico. It lacks buildings from the very earliest colonial periods but provides a rich vein of architecture from the 18th through to the start of the 20th century – houses, mansions, churches, theatres, markets. The Juarez theatre, dating from1903 (photo 1), looks as if it should be in a major European city. And always, as you look upwards, the hillsides crowd in, full of multi-coloured houses. In the evening the central Jardin de la Union comes alive with locals and tourists and offers an oompah band and mariachi players. We are not great ones for “niche” museums but Guanajuato has its full share, covering the standard historical matters and other subjects as varied as “Mummies” and Diego Rivera. If you aren’t “churched out” from all the other Mexican colonial towns, monasteries etc there are some fine churches too – particularly La Valenciana a few kms up and out of town. If you have a car (I understand there is also a bus), carry on around the “Panoramica” whilst you are up there and stop off at the Pipila viewpoint where you can look down almost vertically onto the town center (photo 2). If you aren’t mobile you can walk or take the funicular. All in all a great place for wandering, relaxing, sightseeing, people watching, museum visiting, praying, eating/drinking, traditional music listening, art viewing, souvenir shopping etc etc - whatever you want from a town it would seem that Guanajuato could provide it! Amazing variety in a town of only around 80,000 people! On the last day of our trip to Guanajuato, we went to an Italian restuarant that overlooks the city. As with many sites in Guanajuato, it took some climbing to get there. Our efforts were well rewarded, however: the city glittered with lights and the classic architecture of its churches and the university were ablaze. Bells rang out and we realized that Guanajuato is as magical a place as Venice. It embodies that wonderful combination of Latin and indigeneous cultures that is Mexico. The people are extraordinarily hospitable in Guanajuato and they seem justifiable proud of their unique city. Visit all the churches, the museums, the markets, the plazas and get lost in the alleyways. And don't miss Diego Rivera's home or the unforgettable panorama from El Pipila. 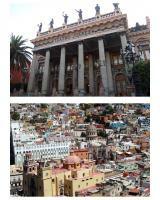 You will remember Guanajuato. Tunnels: The subterranean Roads. The first was built in 1883-1908 other followed. 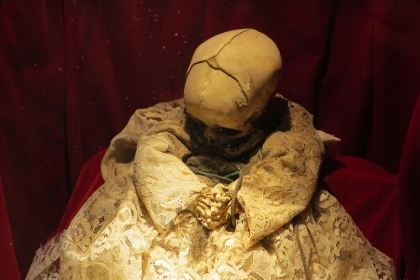 Mummies: The Mummies of Guanajuato are a number of naturally mummified bodies interred during a cholera outbreak around Guanajuato, Mexico in 1833. The bodies were mummified due to the air and weather in the area. Re-routed rivers: "Another distinct feature of Guanajuato is the network of underground caverns and built to divert the Guanajuato River underneath the city"